Evelyn has been acutely visually impaired for 10 years. At 86 she also has mobility difficulties due to arthritis. 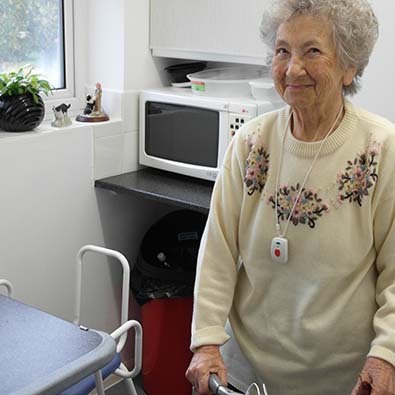 She has recently moved into a flat for the elderly in Rickmansworth. However, the kitchen is small and has a worktop with a projecting sharp corner which she had bumped into on occasions, bruising her hip. Our team made and fitted a padded edge to the corner, so that when she does make contact with it, it will do her no harm.